Summer has definately arrived in Budapest. In fact, when I checked the weather reports on my iPhone on Thursday, I saw that it was hotter here (88°F) than in the Keys. When it gets hot in Florida, you can always cool off on the water, so that’s what we decided to do here in Hungary. 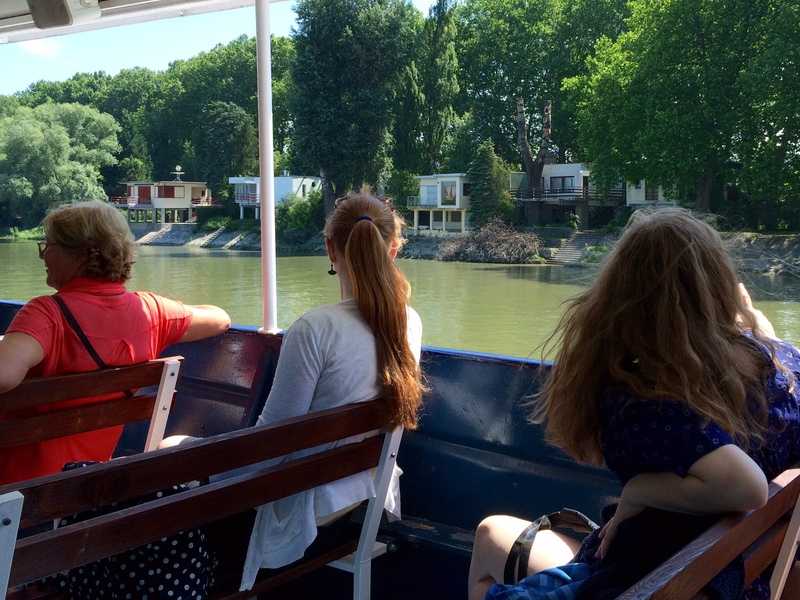 There’s a ferry that leaves near our apartment in the morning for the riverside town of Szentendre an hour and a half up the Danube River that’s known for its quaintness and artists’ community. We arrived at the dock with time to spare and picked choice seats in the nearly empty boat. 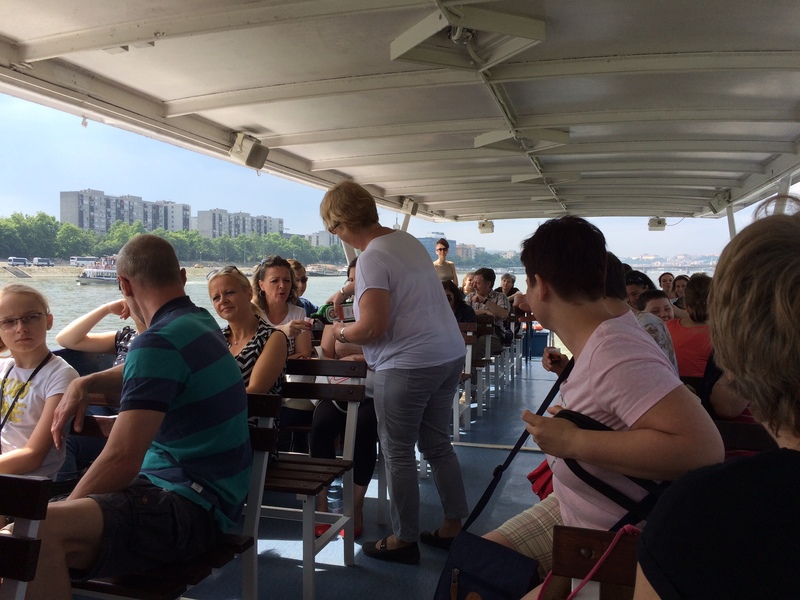 Minutes before scheduled departure, a group of about 25 Hungarian women came aboard, ready for a day out without their hubbies. Shortly after we cast off, the ringleader of the group started walking between the benches passing out shot glasses to her friends and pouring Jägermeister – at 10:00 in the morning! 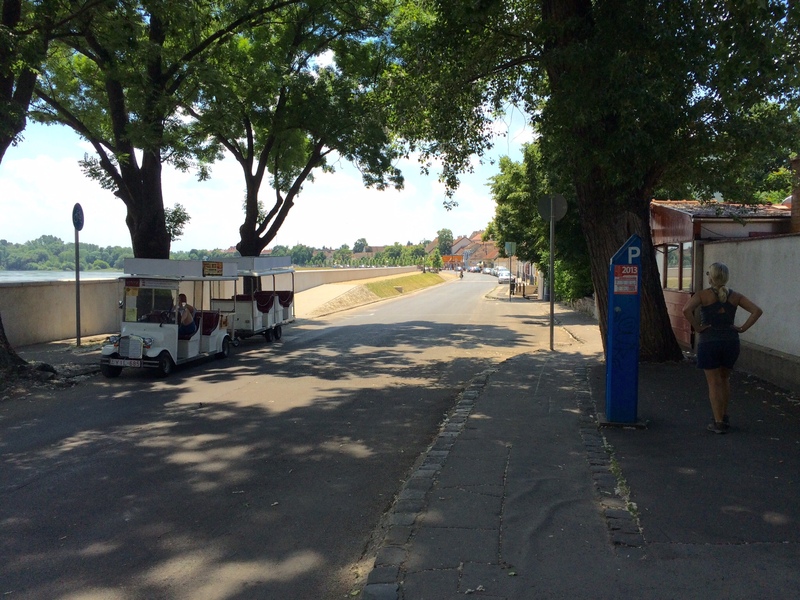 They were having a gay old time by the time we pulled in to Szentendre. About halfway to Szentendre, we passed a neighborhood of cottages on stilts, similar to the construction we have in the Keys. Obviously, they are concerned about the Danube flooding here. A little closer to town, it looked like the trees came right down to the water. Then we realized that it was the water that had risen up to the trees. 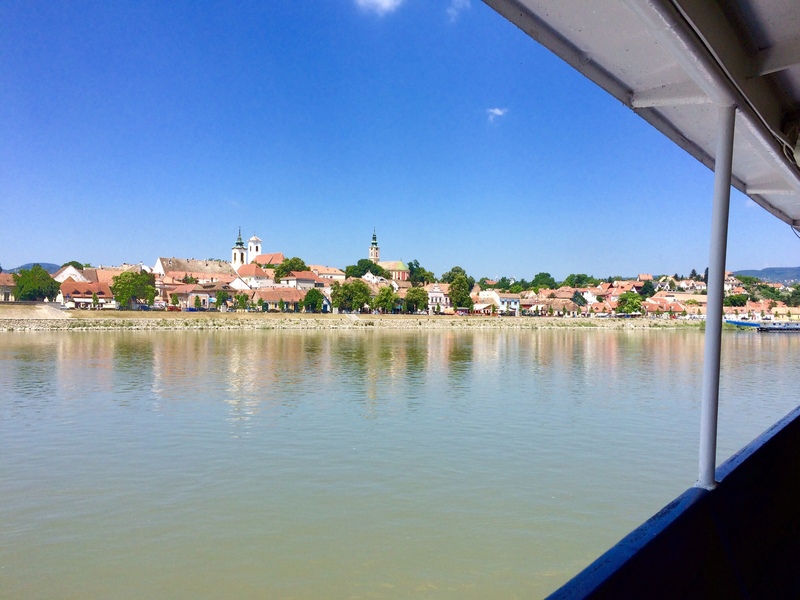 The ferry docks in Szentendre at 11:30 a.m. and then departs for Budapest at 5:00 p.m. Five hours seemed a little too long to us to be in Szentendre, so we bought one-way tickets, intending to take the train back to the big city. It was a cute little town, though heavily populated with souvenir shops and roving bands of trinket-buying tourists. It’s actually built on the ruins of a Roman settlement, the Danube being the eastern border of the Roman Empire. 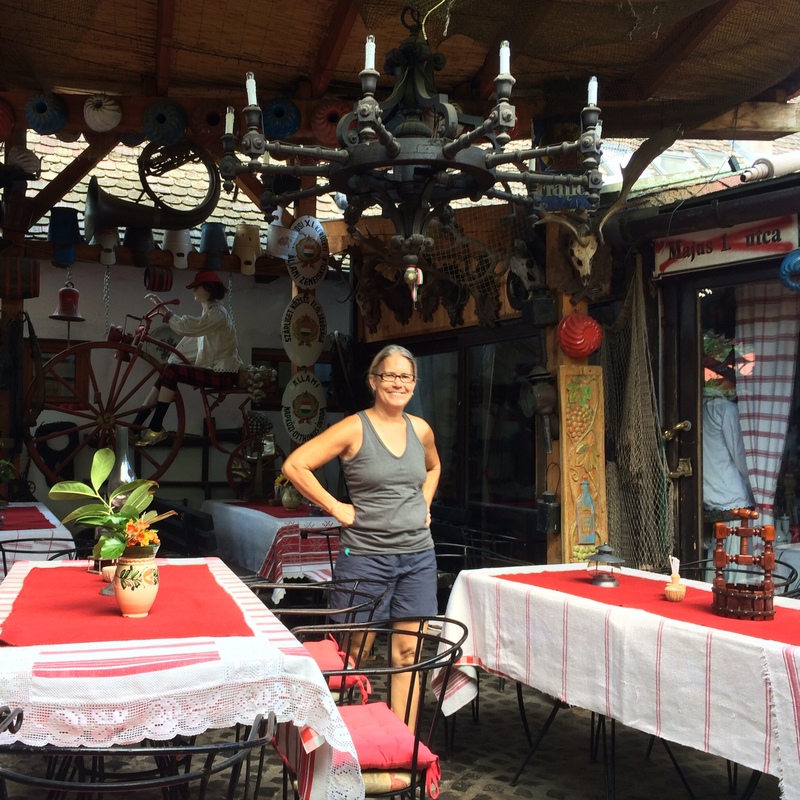 While it was cool on the water during the boat ride, Szentendre itself was stiflingly hot, so we looked for a shady restaurant to have lunch and found one up an alley that could have easily been mistaken for a museum. We were the first ones there and were able to enjoy our meal in shade and solitude before anyone else found the place. 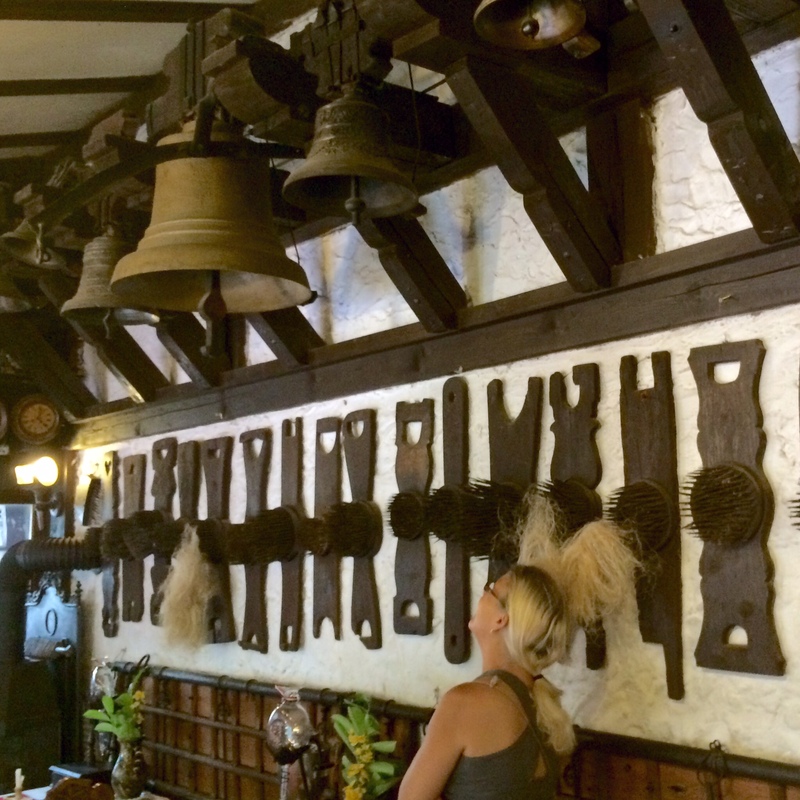 As we were leaving, the hostess saw that we were interested in their collection of antiques, so she led us into a rear dining room where she flipped a switch that turned a crankshaft that rang all these church bells for us. Quite a clatter. Here’s picture of the town square with the old Serbian Orthodox Church facing a Plague Monument. 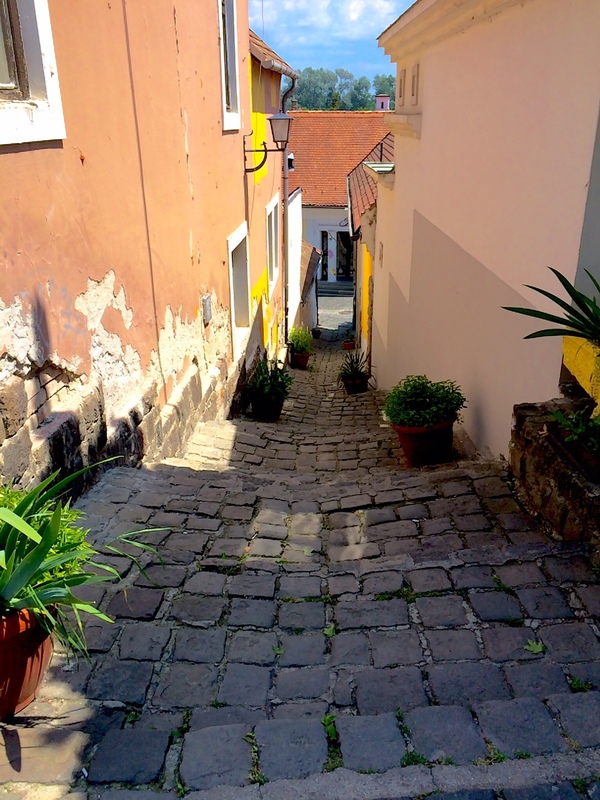 After the Ottoman retreat from Hungary in 1686, about 6,000 ethnic Serbs moved into this then-unpopulated area and in 1746 they built their church. 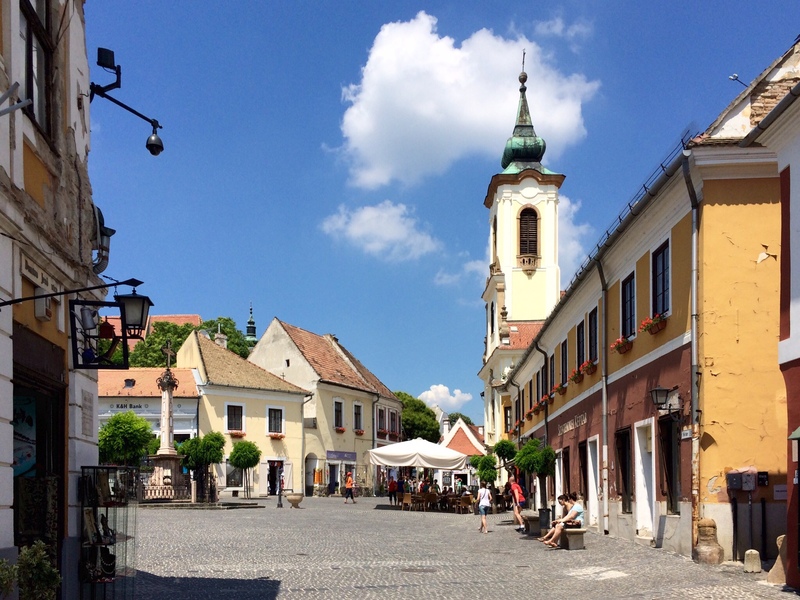 The Serbs are all gone now, returned to their native land, and today the town is nearly entirely populated by people of Hungarian descent. 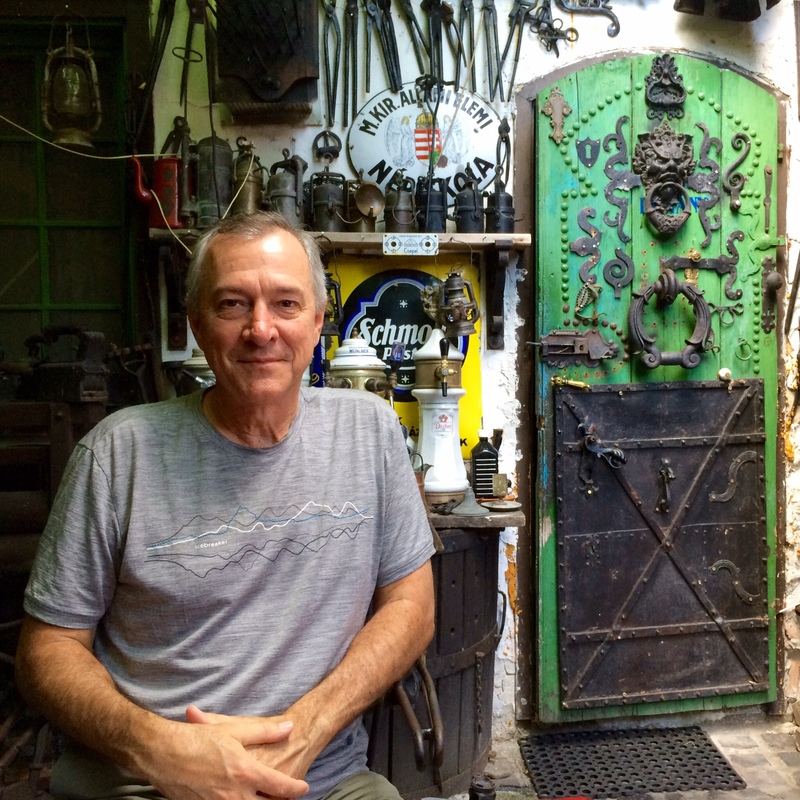 It was fun exploring the old alleys, but the heat was getting to be a little unbearable. 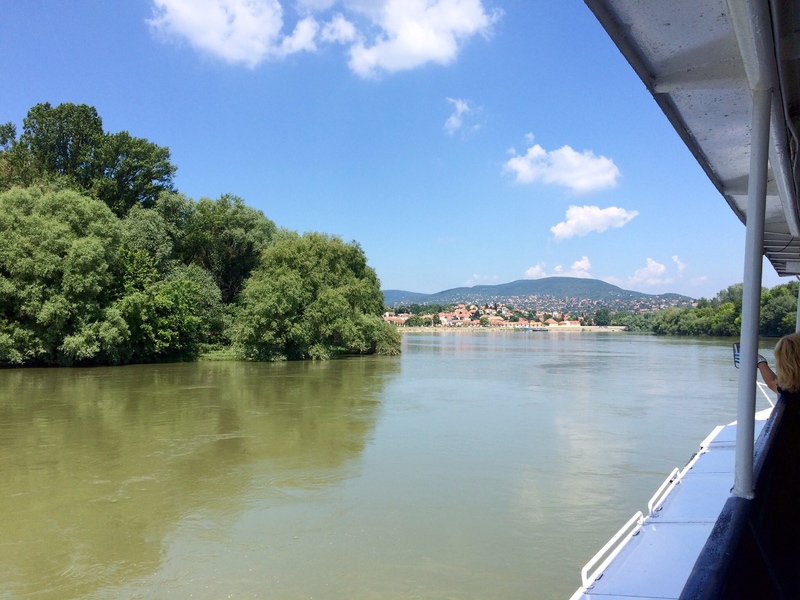 We made our way back out to the Danube, passing a tram driver that we had seen several times during our traipse around town, always doing his best to avoid giving anyone a lift. We passed him three times and he was always chatting on his phone in the shade, far from where he might encounter anyone needing his services. 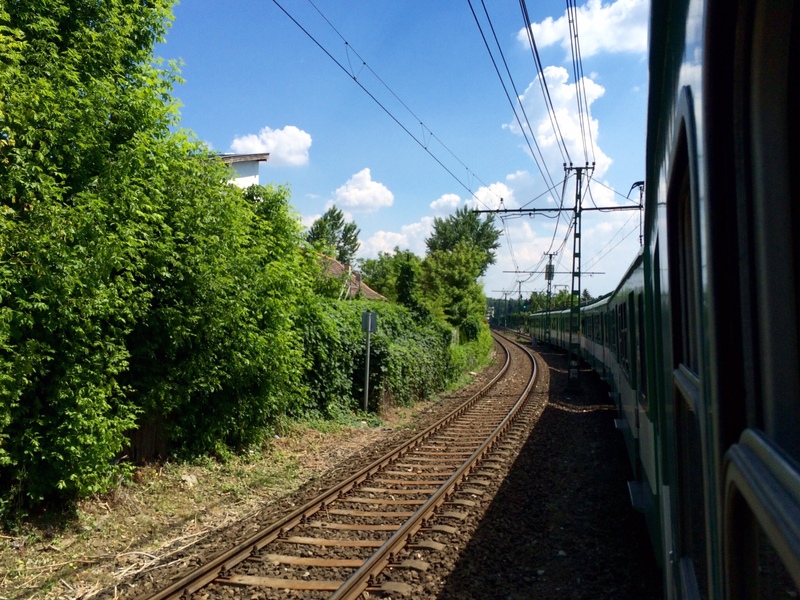 The train station was on the outskirts of town and we were lucky enough to arrive at the station just a few minutes before the train departed. It was nice to get out of the big city for the day.